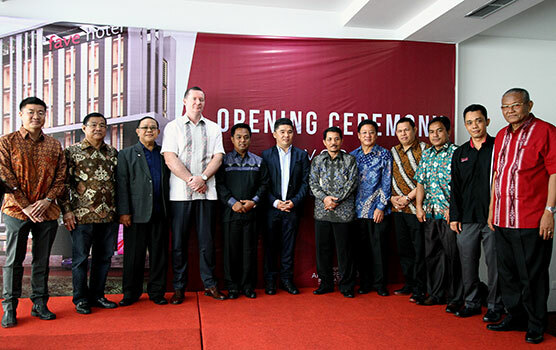 Jakarta, 21th March 2016 - To accommodate the growing number of travelers to Sumatra's hub of history and culture, Archipelago International has recently opened a brand new favehotel in Pekanbaru, Riau. favehotel Pekanbaru is strategically located on Pinang Street, positioning the hotel at the heart of the city's attractions and just 10 minutes away from the Syarif Qasim II Airport. For travelers interested in art, history, and culture, favehotel Pekanbaru is surrounded by the city's many iconic cultural hotspots, including Balai Adat Melayu Riau, the Museum Negeri Sang Nila Utama, Tugu Perjuangan, Tugu Menabung, Tugu Tepak Sirih (Simpang Tiga), Tugu Lancang Kuning, Tugu Adipura, Monumen Bambu Runcing, Monumen Keris, and Monumen Kesenian, all of which offer guests a taste of Sumatra's famed Melayu culture. Kompleks Bandar Seni Raja Ali Haji, better known as Bandar Serai Purna MTQ, is one of Pekanbaru's most popular cultural attractions often hosting many local and national exhibitions, whilst the Akademi Kesenian Melayu Riau (AKMR) invites visitors to learn about the city's traditional music, dance, and theater. Pekanbaru also boasts its own iconic lake, Danau Buatan Lembah Sari, and the Taman Rekreasi Alam Mayang recreational park; both of which attract families and those who enjoy fishing and aquatic recreation. Nearby, Sungai Kampar is renowned as the best surfing spot in the area. Pekanbaru is also famous for its many kinds of local delicacies, traditional fabrics and antique furniture, found throughout the city at different markets, stalls and traditional workshops, all of which are easily accessible from favehotel Pekanbaru. favehotel Pekanbaru features 100 fully equipped guest rooms with a choice of twin beds and connecting rooms. Guests can choose between smoking and non-smoking rooms according to their preference, and, to ensure that every guest enjoys their stay, favehotel Pekanbaru provides room service and a laundry service on request. Each room comes with 100% cotton bed sheets and duvets, en-suite bathrooms with standing showers, individual ACs, 32" LED TVs with international and local channels, and a writing desk with universal power outlets. To keep guests connected, IDD telephones and free Wi-Fi with a super-fast connection is available throughout the hotel. For business travelers, favehotel Pekanbaru provides 3 meeting rooms with a pre-function room, as well as the signature Lime Restaurant for casual affairs, and parking facilities to accommodate guests. For security, favehotel Pekanbaru provides in-room safety deposit boxes, security key card systems, CCTV and 24-hour front desk services & security, and for Muslim guests, a Mushola is available within the hotel.